In a first-of-its-kind initiative in Indian, around 25 bee farmers from West Bengal and Punjab learned scientific techniques of ‘Queen Rearing & Royal Jelly Extraction’ and the use of Bee Venom Collector (an innovative equipment for honey collection from beehives) to further hone their bee-keeping skills. This specialised training camp, which occurred from July 4th to July 10th 2016, was organised by Hi Tech Natural Products (India) Ltd in association with National Bee Board(NBB). The entire training programme was carried out by the able guidance of Devvrat Sharma, Managing Director of Hi Tech Natural Products. 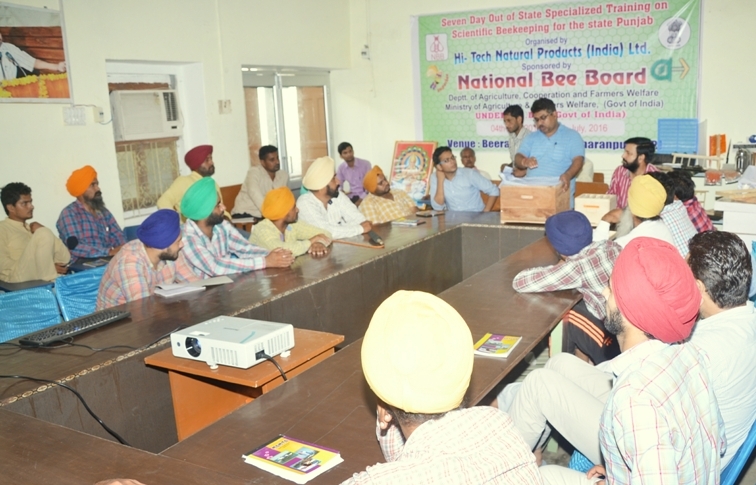 The trainees from Punjab were represented by Mr. Madan Sharma, (General Secretary, Progressive Beekeepers Association, Punjab) who apprised off with the problems being faced by beekeepers in terms of investments, the cost of production, and lack of proper scientific training which tends to affect beekeepers at large. DPS Tech Smart is another company which works in the field of bee-farming. It has come up with proper research and study in the field and has developed affordable and food grade scientific bee-keeping equipment with a projected view of developing better techniques to producing honey and other bee products. The participants, with on-field training & practical sessions, got an insight in to the these techniques developed by DPS Tech Smart. With the availability of an affordable Bee Venom Collector for Indian beekeepers can be self-dependent in terms of generating revenue by producing bee products besides honey. The training also was attended by Dr. B. L. Saraswat, Executive Director NBB who answered queries & also urged all trainees to follow Govt. Registrations and maintain quality standards that would help them benefit out the Bee keeping business. He also introduced schemes of MIDH and NBB programmes – specially focused on the industry.